Southeast Michigan: Detroit, Ann Arbor, Dearborn, Monroe, Livonia, Sterling Heights, & surrounding areas. Flint / Tri Cities Area: Flint, Saginaw, Bay City, Port Huron, & surrounding areas. Mid Michigan: Lansing, St. Johns, Alma, Mount Pleasant, Jackson, Battle Creek & surrounding areas. West Michigan: Grand Rapids, Muskegon, Holland, Kalamazoo, Benton Harbor, & surrounding areas. 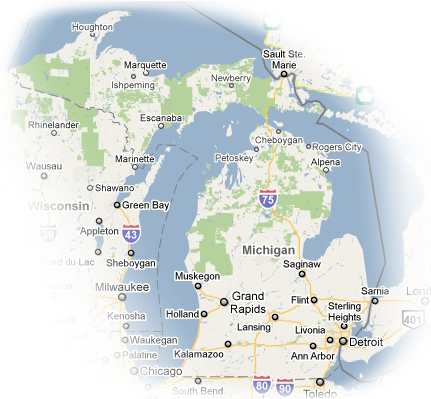 Northern Michigan: Traverse City, Petoskey, Cheboygan, Rogers City, Alpena, & surrounding areas. Upper Peninsula: Escanaba, Houghton, Marquette, Sault Ste. Marie, & surrounding areas. Council Members serve many areas in Michigan. Click on the area links above, the map to the left, or scroll down to find help in your area. Care Matters is a devoted advocate for individuals and families who are impacted by traumatic injuries, chronic conditions, disabilities, or everyday stressors. We provide meticulous care management to minimize or remove barriers that inhibit the quality of life. We can provide you contact with various elder care services in the Flint / Tri Cities Area. Although this area is temporarily without a member to assist you we can still help you solve any concerns or problems you may have. Please contact the Michigan Care Planning Council by clicking on the link below. We can provide you contact with various elder care services in Northern Michigan. Although this area is temporarily without a member to assist you we can still help you solve any concerns or problems you may have. Please contact the Michigan Care Planning Council by clicking on the link below. We can provide you contact with various elder care services in the Upper Peninsula. Although this area is temporarily without a member to assist you we can still help you solve any concerns or problems you may have. Please contact the Michigan Care Planning Council by clicking on the link below.